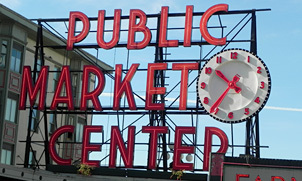 Pike Place Market: It’s one of the most visited places in Seattle. Locals and tourists alike come to shop for fresh produce and hand-crafted items, enjoy a meal with stunning views, or just wander, experiencing the vibrant and colorful setting. Hard to imagine it might not be here at all if property developers and city officials were to have had their way. In the early 1960’s, the Market was the target of urban-renewal-by-demolition. Friends of the Market was created in 1964 to protect and defend the Market from the “black wrecking ball”. Led by the inspirational architect Victor Steinbrueck, the Friends waged a hard fought, community-wide campaign to “Keep the Market”. 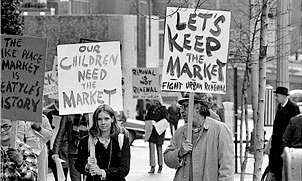 In 1971, after seven years of uncompromising political struggle, Seattle voters resoundingly passed the Market Initiative. This initiative, sponsored by the Friends, created the Market Historical District and placed its administration firmly under public control. It was a direct vote of the people that saved the Market! Pike Place Market is now thriving – it hosts 15 million visitors a year. And, in June, 2017, a new $74 million expansion called MarketFront opened. It represents the completion of the historic district after more than 40 years of study and planning! Please Click Here for more information and images. Friends of the Market remains steadfast in its commitment to preserve what was famously described in 1964 as, “A real place in a phony time.” It is a membership organization that invites you to come join the effort to help preserve, maintain and extend the Market’s history. Please be sure and visit our Events page for upcoming events. We often have interesting lectures and discussions about the history and future of the Pike Place Market. 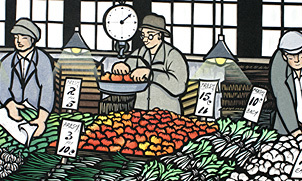 See our Tours page too and come out for a informative and fun “inside look” at the Market during the summer! Friends of the Market has advocated for the Market for over 50 years opposing those who would disregard its history and responding to issues large and small. Pike Place Market has for decades inspired artists who left a permanent collection of “public art” in its streets, alleys and byways.